The third Mario Kart Arcade GP game that ditches the other PAC-Man characters in favor of only including the Pac himself and removes Rainbow Cup, but adds characters with palette swaps, gliding, underwater, and Don-chan. Oh, and no more Mario Card! Present in flash/data_jp/common_tex/tex/test.pac are test character icons of all the characters from the first release (Rosalina is there as well because her files are present in the first release) in dds format. The most notable difference is Pac-Man, as he uses his older model from GP1/2. In the final, he uses his appearance from Pac-Man and the Ghostly Adventures. There's also smaller versions of the same icons. 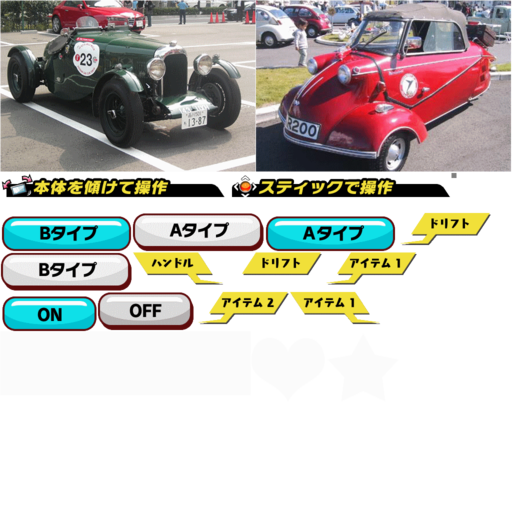 flash/data_jp/test_data/test_datatex.pac contains two Mario icons (much like the ones in test.pac), and sprites for a test menu and two images of old cars in Japan, most likely at some kind of car show. They may have been used to test the camera. flash/data_jp/select_00/select_00tex.pac has placholder sprites for the class selection and other sorts. 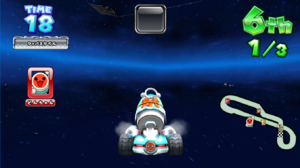 It reuses artwork from GP1/2, Mario Kart Wii, and Mario Kart 7. 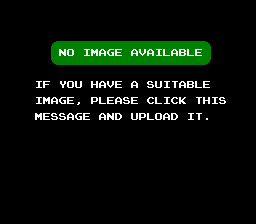 Present in flash/data_jp/common_tex/tex/chara_p00.pac, in the first release, are character select icons for Yellow Yoshi and Blue Yoshi. There may have been plans for more palette swap Yoshis as DLC, but got cut for unknown reasons. Only Red Yoshi and Black Yoshi were released. Red Yoshi's icon is present as well, but Black Yoshi's wasn't added yet. Yellow Yoshi's slot ID is 16 (0x10), and Blue Yoshi's is 18 (0x12). Lakitu's object graphics have a U-turn sign, along with a specular map for it, for when the player goes backwards, but since the player can't go backwards, it goes unused. There's also no model for it, and a glitch can be done to force the player to go backwards by disabling the warps at Peach Castle or Kingdom Way, but it doesn't attempt to appear either. Find/create new videos of tracks. There's a total of 4 unused tracks in this game. One debug track, and 3 regulation maps. 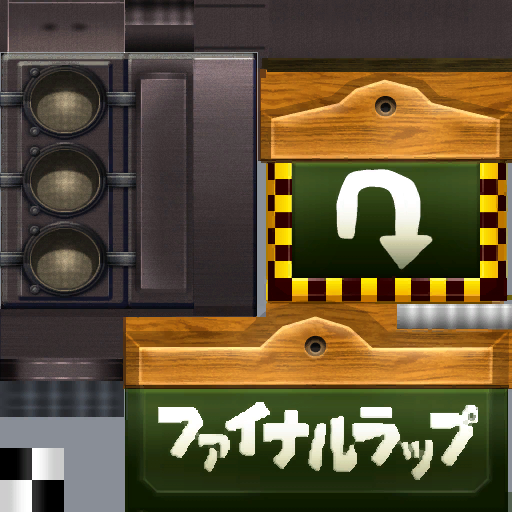 In Model/stage_debug, all the folders for the tracks are present, but all are empty except the KP folder (Toad Cup). In it, is a debug track with only the dirt road texture and the skybox texture with one of the areas from the Toad Cup tracks, and the skybox model. The track is an early/unfinished version of Kingdom Way with only a dirt road of the entire track. The video shows how the track looks (the water, mushroom model, star model, and shadows aren't originally part of the track). This track also doesn't have it's own collision file or any other sort of file. In the Develop directory, there's 3 folders called RegulationMap00, RegulationMap01, and RegulationMap02. 00 is an early version of Bon Dance Street, 01 is a very early version of Omatsuri Circuit, and 02 is an early version of Aerial Road. Unlike the debug track, these have their own collision data. Omatsuri Circuit actually has a bit of different mapping, like a shortcut slope, which is similar to the ones in GP1/2, and the part where the underwater section is, has a higher height. This track is also possible to fall through because a small part of the road isn't solid, and under all tracks is actually completely solid road that goes on forever. This could be because there's no areas in the game where the player would fall off, so the road most likely prevents the player from falling forever just incase a glitch ever happened. However, it's impossible to complete a lap under the track. Aerial Road doesn't have a cloud section at all, just a wooden road. Sound/Bank/NUS3_BANK_BGM.nus3bank has a song called race_test, but the wav file was removed. According to the sound names in NUS3_BANK_COMMON.nus3bank, there were a total of 9 test sounds at one point, but they were all removed. They were named (in order) SoundTest1, SoundTest2, SoundTest_Signal1A, SoundTest_Signal1B, SoundTest_Signal1C, SoundTest_Signal1D, SoundTest_Signal2A, SoundTest_Signal2B, and SoundTest_Signal2C. 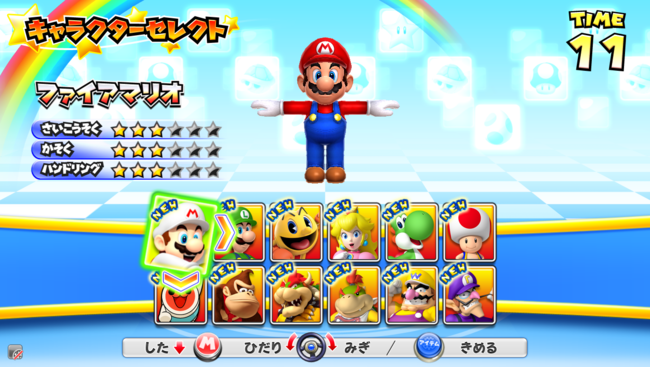 For whatever reason, if Fire Mario's slot ID (0x0E) is moved to a different character slot, such as Mario's, by editing the file CharacterSelectParameter.bin in MenuParam/data, his icon will display and name, but regular Mario will appear in T-pose. When he's selected, the game can't go to the next menu, selecting the kart. 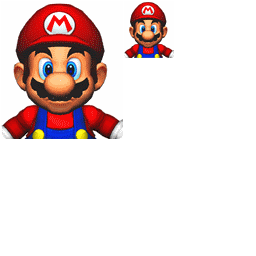 Along with this, Fire Mario also has files for a separate character (Model/driver/f_mario), as he's normally a palette swap of Mario. The used files for him are with Mario's files. In the first release of the game, Rosalina and Metal Mario have all of their files present, almost fully complete. The only things missing are some icons for them, as they use placeholder ones, and Rosalina uses one early icon for the camera image. 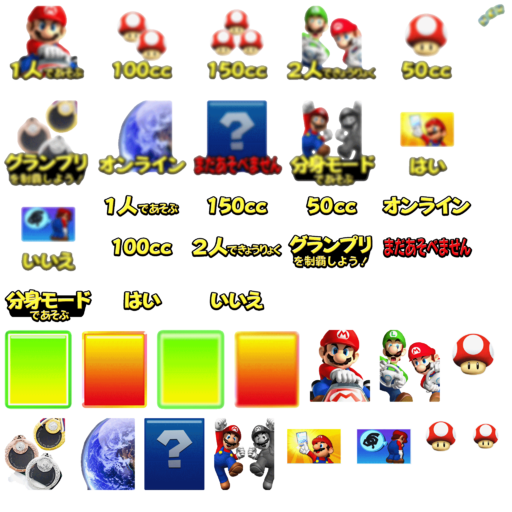 They were even added into the game before Bowser Jr. was added, as their slot IDs are 0x0B (Metal Mario) and 0x0C (Rosalina). Bowser Jr.'s is 0x0D. This page was last modified on 20 October 2018, at 07:04.